A few weeks ago, I had my eyes checked and learned (no surprise) that I needed a stronger prescription for my left eye. I ordered new lenses for my glasses last week and stopped by the optical shop this afternoon to get them put into my frames. They said it would take about 90 minutes, so I had time to kill on 7th Avenue, one of Park Slope's well-traveled shopping districts. My first stop was Clay Pot, an eclectic shop where we've found clever mugs, cute earrings, and stylish serving ware, not to mention my engagement and wedding rings. 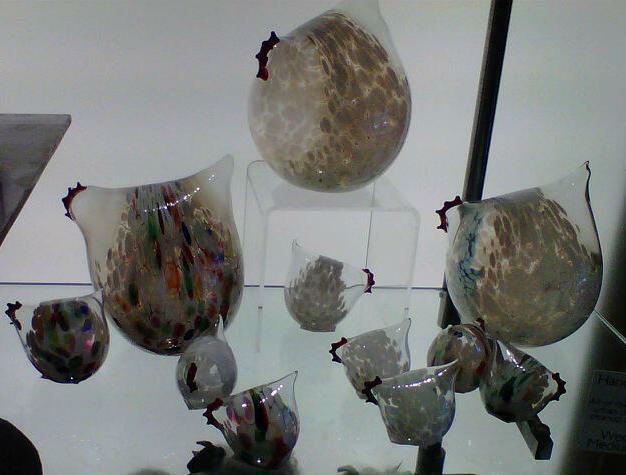 Today, some blown glass chickens caught my eye. (Have I mentioned my bordering-on-obsession fixation on chickens?) I didn't buy any, but I did send a photo to my husband (hint, hint). Next, I headed to Barnes & Noble, where I fully intended to look at their Nook e-reader. I have a first generation Kindle (see ancient-looking device to the left), which is fine, but I'm constantly frustrated by 1) not being able see what page I'm on relative to the number of pages in the book, and 2) not being able to see how many pages are left to the end of a chapter. Recent ads for the Nook show page numbers at the bottom of the screen, something like "page 47 of 384." 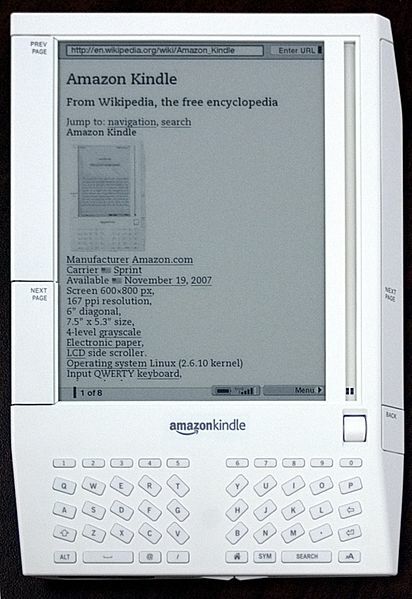 I'm not excited about paying for a new e-reader, but it would be worth it to be able to know how may pages are left. Now, I do realize that if you change the font on the Kindle (my husband and I use very different sizes), it changes the number of pages in a book, but isn't this the sort of simple math that should be a breeze for an electronic device? Anyway, I went into B&N to look at the features on the Nook. 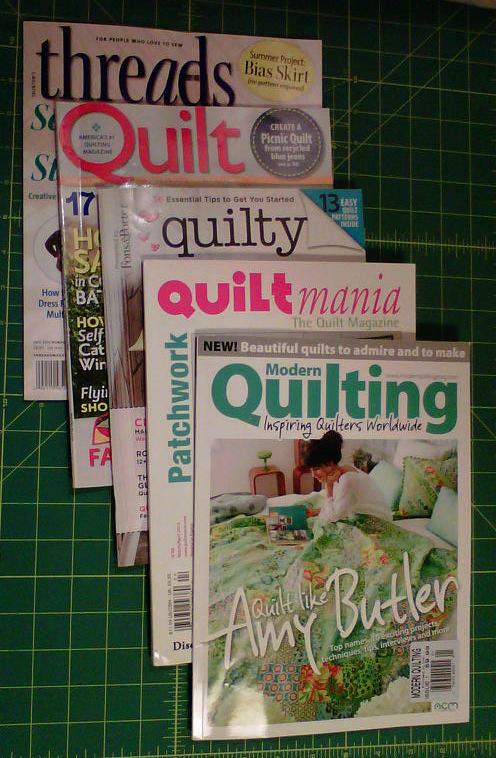 I got distracted by the magazine section and thought I'd see if there were any new quilting magazines. Well, of course there were, including a few I'd never seen before. 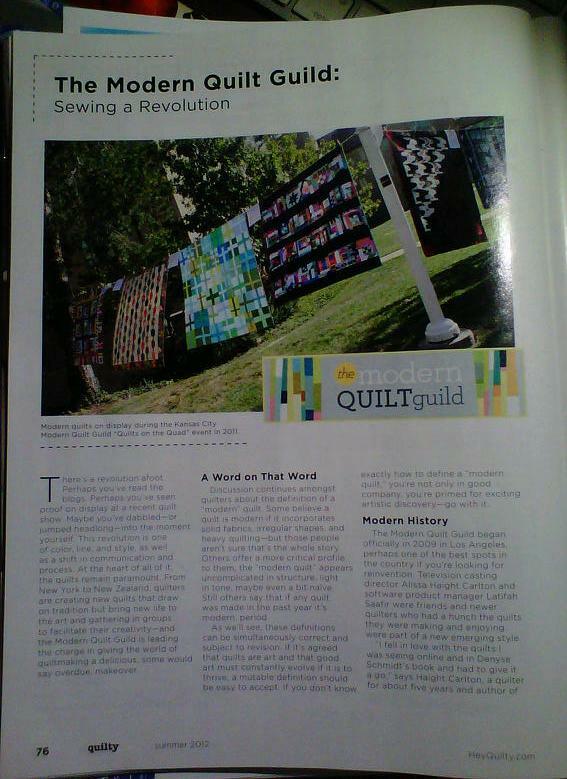 Modern Quilting is from the UK and has some cute patterns in fabulously bright colors. I'm looking forward to poking around their website to see what other lovely things they have to offer. 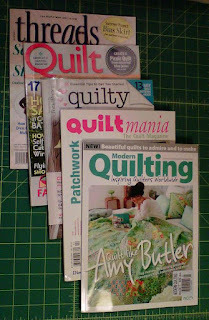 Quilt Mania is printed in France, but thankfully this was the English edition. My high school French isn't good enough for me to understand quilting instructions. 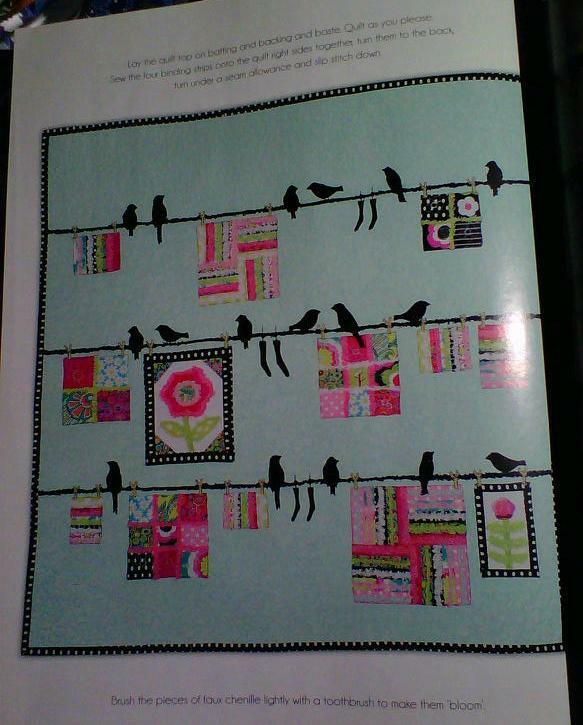 It has some interesting articles about the 11th International Tokyo Great Quilt Festival and the Reiko Kato Exhibit (also in Tokyo), but my favorite thing in the magazine is the pattern for "Bird on a Wire," the quilt featured on the cover. While some of the patterns in Quilt are more traditional than in the modern-focused magazines I found, several of them got me thinking about new projects. Even an old tried-and-true pattern can be made to look new with creative fabric and color choices. By the time I left Fiber Notion, my glasses were ready and I stopped back to pick them up. Aaaah! Now I can see to read all of my new magazines!